Your school supplies? The best of the crop of course; we're talking about Kate Spade journals, glittery pens à la throwback to the '90s, and fruit-scented erasers fragrant enough to send you on a trip to the tropics. It's time for Pop Quiz, a new series on Runaway In LA where I interview the world of talented and sartorially blessed individuals around the online realm. Forget about the SATs and AP exams; the winning formula lies in intellect and style. Today's subject matter? 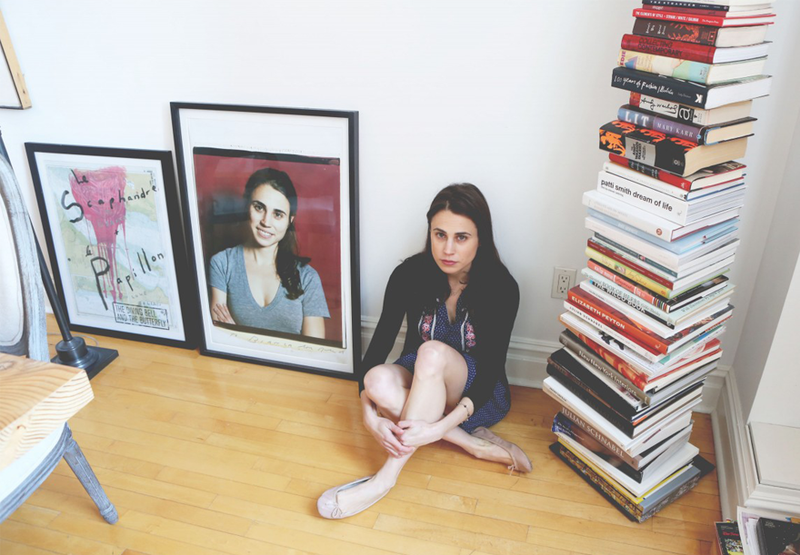 Bianca Turetsky, author of the best-selling The Time-Traveling Fashionista book series. 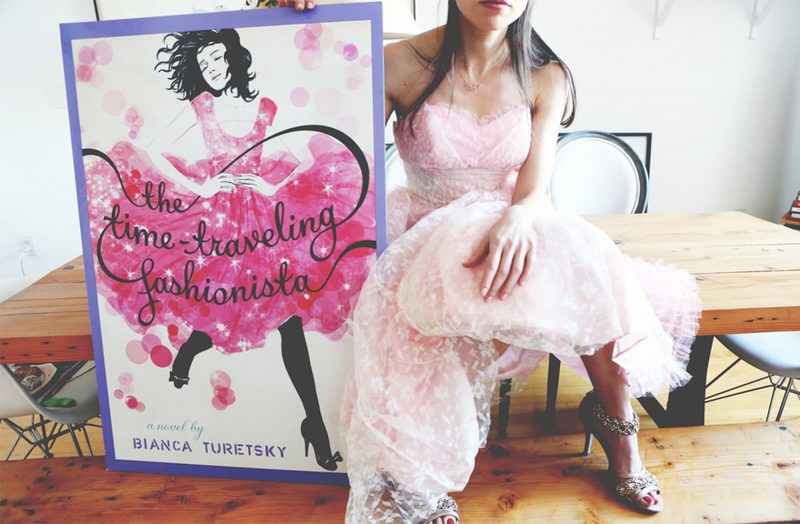 As a survivor of high school history classes (RIP AP US History), I can guarantee you one fact: if the monotonous textbooks of social death had been swapped with Bianca Turetsky's The Time-Traveling Fashionista, I would have likely devoted more quality time to devouring the pages. I mean, if I'm being schooled on Cleopatra, I also expect to hear about ivory ethereal gowns and enough kohl eyeliner to sentence a Sephora to mercy. Likewise, Bianca understands this issue and has sought to cure our couture-hungry appetites, a craving that suspiciously seems to arise every time we crack open a history book. Why slave over the Protestant Reformation when we could be dining on Philip Treacy? (Who, by the way, is famously known for crafting the extravagant fascinators that dwell upon the royal family's tresses. Kate Middleton, we're officially jealous). 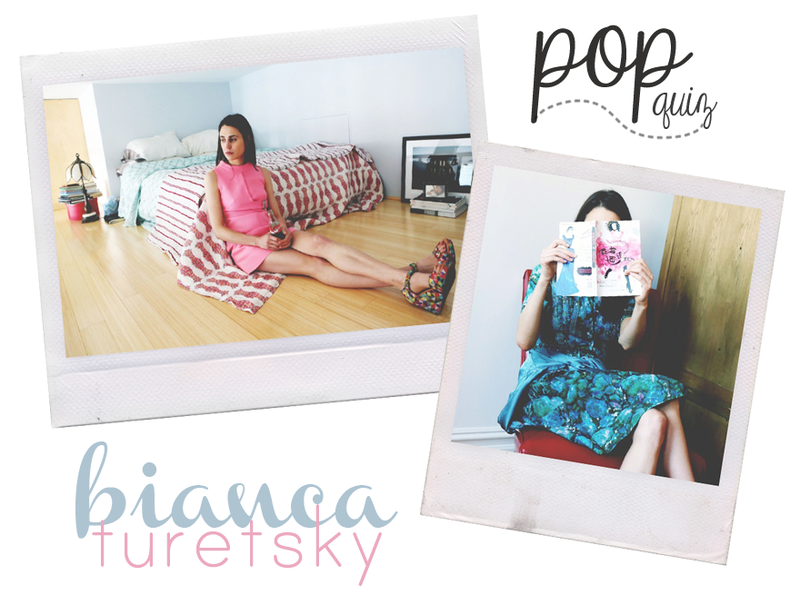 A Brooklynite with a penchant for all things vintage, Bianca is quite the style aficionado off the pages. Naturally, her book series translates her sartorial knowledge from reality to the fictional realm, mixing in a colorful dose of historical events as the finishing touch. Through the eyes of twelve-year-old Louise Lambert, readers are whisked on a first-class journey to various eras, from 1912's Titantic sinking to 17th century Paris with cake connoiseur Marie Antionette (let us not forget Sofia Coppola's rendition with Kirsten Dunst either). Rich, aesthetically enchanting fashion illustrations are also scattered amongst the pages of the books, doubling its level of enjoyment and making it a perfect read to consume on a hammock by the beach. 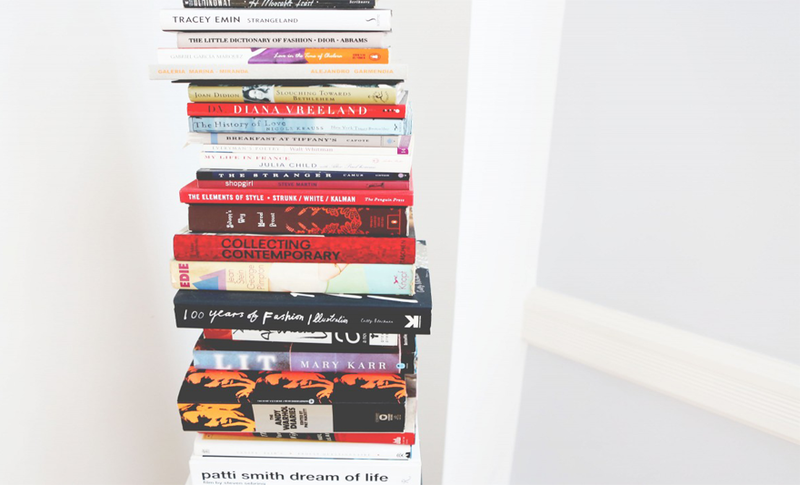 It is safe to say that any insatiable case of wanderlust can effectively be vanquished through the literary escapes of The Time-Traveling Fashionista. I was recently fortunate enough to chat with Bianca on unearthing her best vintage find to the one city pet peeve that will have you re-evaluating your next trip down under (and we're talking the metro variation, not your paradisiacal Australia). Time to whisk out your trusty pens and take notes. Pop Quiz! Your main character, Louise Lambert, is very style conscious. Even though she loves the Grecians gowns of the Egyptian era to Marie Antionette-style dresses, what modern day designer would you picture her to obsess over? Louise would definitely be obsessed with Rodarte. From every interview I’ve read, it seems like Kate and Laura Mulleavy are so influenced by the past, by old movies, classic books, everything Louise (and I) love! They take vintage inspired themes and create something new and beautiful. I think Louise would totally be into that. Who would you want to cast as Louise if your series were to be adapted for television or film? I daydream about this all the time! I wish I could time-travel for casting and get a 12 year old Natalie Portman or Molly Ringwald. But today I could see Kiernan Shipka or Elle Fanning playing Louise. There are so many talented young actresses out there⎯I’m up for suggestions! Which decade would you want to live in? At the risk of sounding corny, I’d say this decade. There are so many I’d love to pop by for a visit (20’s, 50’s, 70’s just to start…) but I’m pretty happy with the way things are now. I’d miss my friends and iPhone! I’d say a “there’s no place like home” theme runs throughout my books⎯by visiting other eras Louise begins to appreciate her own life a little more. When I was in Spain writing The Time-Traveling Fashionista at the Palace of Marie Antoinette, I went to this amazing vintage store called Madori (which sadly has closed since) and found a gorgeous long white tiered dress with handmade lace trim that looked like something made by Dolce and Gabbana. The dress probably dates back to around 1910⎯just the period I wrote about in my first book. The fabric is so delicate that I’m afraid to wear it out of my apartment, but I love it. One song that describes your style? Girls Just Want to Have Fun by Cyndi Lauper. I try to have fun with fashion and not take it too seriously. What’s the worst that can happen, you make some questionable fashion choices? I’ve definitely done that, many times over, and survived. And the photos are pretty funny later. Your number one pet peeve? I think this is specific to NYC, but people who clip their fingernails on the subway. WHY??? I have so many fashion icons: Diana Vreeland, Lauren Hutton, old-Hollywood movie stars like Elizabeth Taylor and Audrey Hepburn. Currently I love Alexa Chung’s style. She mixes vintage pieces with new younger designers and always makes it her own unique take. I also love Jane Birkin, and obsessively click on any “how to dress like a French woman” blog post. Whenever I’m in Paris and someone asks me for directions I consider it a little style victory. One place you'd love to travel to in the future? I’d love to visit Brazil. I’ve been lucky enough to have travelled all over the world, but I’ve never been to South America so I think that will be my next stop. The food, the culture, the fashion, the beach. What’s not to love? I have a few! Dark chocolate, reality television, and DryBar blowouts are probably my top three. Sometimes all of those things can actually happen at the same time and my head pretty much explodes from happiness. Bonus question! What macaron flavor would you be? I LOVE all macarons, so this is a tough one! I’ll say lemon, sweet but with a little bite. Now that you've been schooled on the basics, it's time to put your education to the test. First task? Make sure to check out The Time-Traveling Fashionista, which is not only the perfect poolside companion, but a wonderful additon to your trove of exam stressbusters as well (tip: pair accordingly with coconut water and a lounge chair for maximum effect). Special thank-you to Bianca and her team for taking the time to collaborate with me for this interview! Which era of fashion is your favorite?